Maasai Children’s Initiative (MCI) came into existence through an unlikely connection: a Seattle attorney on holiday in Kenya and his guide, a young Maasai woman. The tour explored parts of Maasailand, including a visit to a school where Maasai students sang a song for the visitors with lyrics saying, “Maasai girls don’t need to marry at such a young age, they can learn and stay in school.” The words brought tears to the guide’s eyes and the attorney questioned why. Sekeyian Yiaile, a reserved woman, poured out her story to a man who wouldn’t remain a stranger for long, Matthew Bergman. Ms. Yiaile confided that she was Maasai and that education has historically not been a priority for her people; over ninety percent of children do not complete primary school. Girls fair even worse; most have no schooling at all. Only 5% of women in the Maasai Tribe can read. Sekeyian’s own mother had chosen a different path for her, allowing her to attend a Catholic school run by missionaries near their village. Sekeyian met women doctors and nurses at the clinic near her school, which allowed her to imagine a different life for herself. When Sekeyian was in fifth grade her father died. Her uncle selected a husband for Sekeyian, a fifty-year-old man with two wives. Sekeyian knew that marriage meant the end of her education, and the rest of her life she would be a wife and mother only. She found the courage to refuse, something unheard of in this patriarchal society. Her uncle and male family members responded to her “ungratefulness” with repeated beatings, so Sekeyian ran away and found help with the missionaries who enrolled her in a distant boarding school. Today, Sekeyian Yiaile is the executive director of Maasai Children’s Initiative. Matthew Bergman serves as chair of the MCI board. 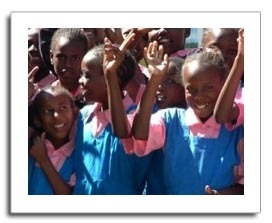 Together they have raised funds and opened two schools for girls, with 300 students enrolled. The Maasai are one of East Africa’s poorest tribes. Educating children has been called a “game changer.” Learning to read means they have the ability to connect to the world through the Internet. The MCI schools have solar powered computers. Cell phones allow them to all have information at their finger-tips, and unlike North Korea or China, African countries have yet to attempt to censor or deny access to the world-wide web. MCI’s mission is to empower girls through education, which includes the ability to read and write in the national languages, Swahili and English, as well as their own language Maa. Part of the vision of MCI includes promoting computer literacy and providing skills to compete for jobs. Click here to learn more about MCI. A gift of jump ropes brings joy! Copyright © 2018 KellyAnnBrownFoundation.org -- All rights reserved.